I love when I get new products to try, and when new surprises await me in the mailbox or outside my door. 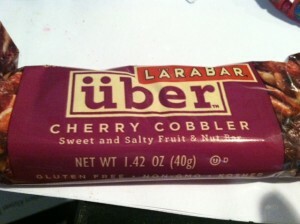 To my surprise, I found a little bag from Larabar with some of their new bars, Uber bars, which are sweet and salty fruit and nut bars. I got 4 flavors. Bananas Foster, Cherry Cobbler, Apple Turnover, and Roasted Nut Roll. First one up? Bananas Foster. HAD to try this one first, as I love anything Banana flavored! This one had only 14 carbohydrates, which impressed me, but had 17 grams of fat. I see that as a lot for a snack, but at least it’s heathy fat from walnuts and such. The taste was pretty good! It reminded me of a banana walnut muffin at first, when you take the first biteand the muffin top is full of walnut pieces. 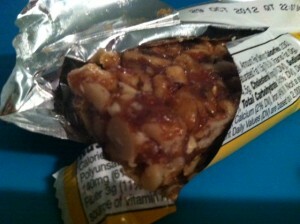 It had a banana flavor, and the walnuts were nice and crunchy, however, the bar was still pretty soft in consistency. There was a bit of an awkward saltiness to it however. Like a little too salty. Don’t get me wrong, it was good. I just think the saltiness outweighed the sweet, and I kind of wish I could throw a chocolate chip or something in there. All I can say is YUM YUM YUM. It was buttery, crunchy yet soft, and tasted like apple pie :D. It was sweet, had pieces of dried apples and raisins, and it didn’t have so much of that “salty” thing going on, which I liked. 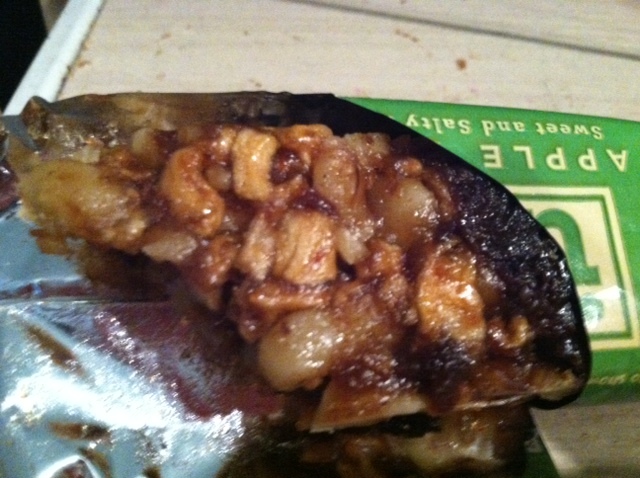 In a nutshell (hah), it was super delicious, and it was sticky! There was a little bit of tartness every now and then, and I felt like I definitely needed some water. I thought it was mostly almond flavor for the nuts, but it was actually walnuts! Last up, The Roasted Nut Roll. Overall, really good bars! I like the Uber line, and will definitely buy if I see them in the future. I got my 4 to try for free, and I’m glad I got the chance to try them! 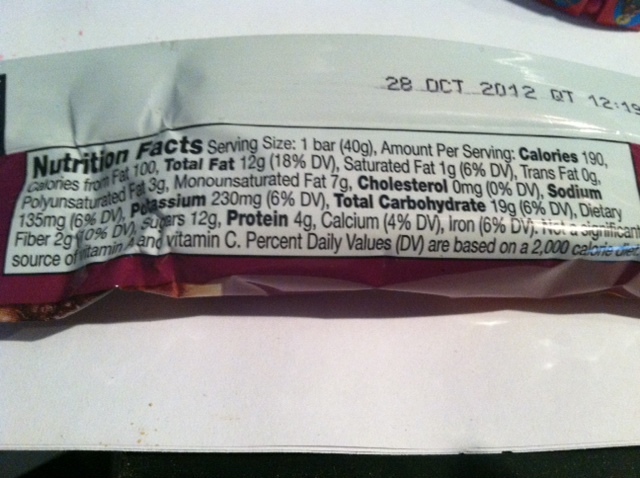 The nutritional information of each bar is similiar, but here is one of the bars stats. 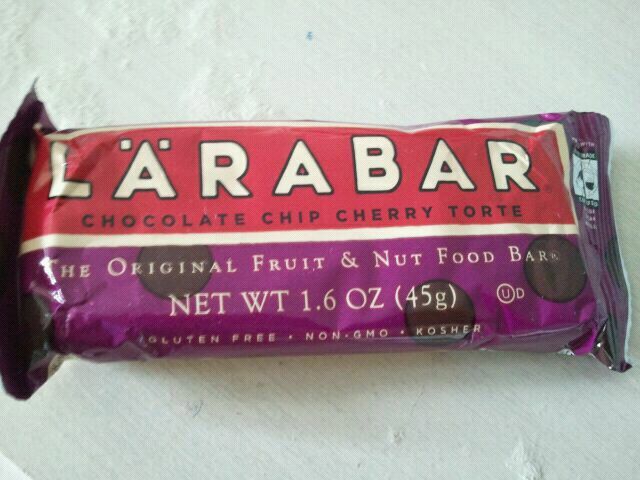 YEP- some Chocolate Chip Cherry Torte LARAbars! With a cute little bag, button, sticker and slice of information pie. What a nice welcome surprise once I walked in the door and had a package waiting for me. Thanks, LARAbar!!! Now, down to business. It looks like your standard LARAbar…. This one ROCKS!!!! 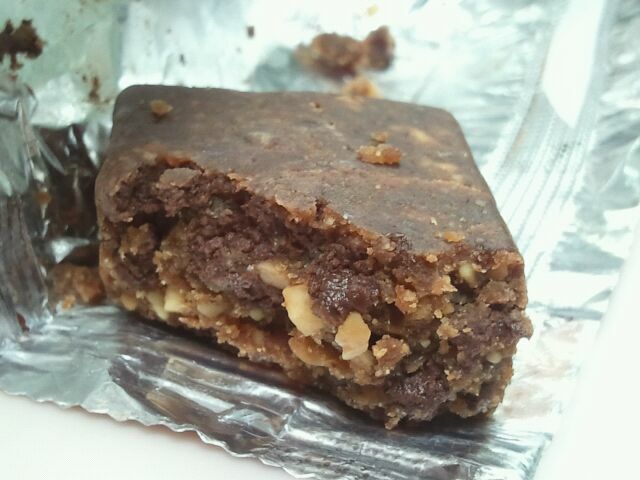 I noticed the bar seemed softer than usual when I took a bite, but still had that sticky density we all know and (hopefully) love. As I kept chewing, I really loved this bar. It tastes like chocolate covered cherries!! It was sweet and tart, with that classic date taste. But, then you get a hint of dark chocolate flavor and a teensy bit of crunch. I really felt like I was eating almost a cordial cherry, with chocolate covered coating. 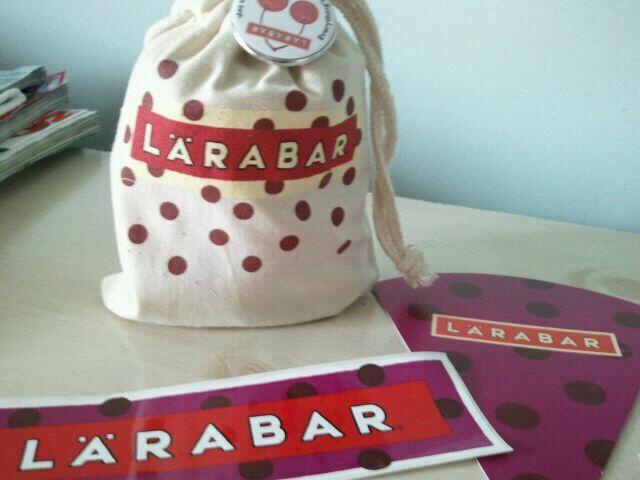 This is definitely one of my new favorite Larabars!! And, according to the wrapper, this baby is Gluten Free and gives 1/2 of a fruit serving. What’s not to love?? Overall, this gets 4 1/2 stars. Really delicious! I will definitely buy in the future!! I’m almost always up for anything that involves peanut butter and chocolate. And when it’s gluten free, AND made with minimal ingredients? SIGN ME UP! But, of course, this was not the case. As I continued to eat it, the subtle flavor of the peanut butter became more prominent. This was actually REALLY tasty! A good chocolate-y flavor, and not so fruity where it’s tart, but rather a subtle fruity flavor. The flavor of the peanuts shined through as well, especially after a few bites. It was kind of like a fudgy brownie with peanuts in it! 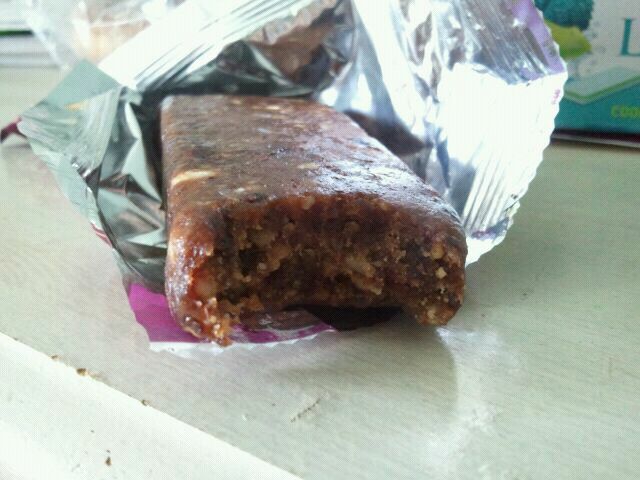 The bar itself was moist, chewy and dense, but in a good way. 1 bar (45 grams) is 230 calories, 12 grams of fat (3.5 saturated), 26 grams of carbohydrates, 4 grams of fiber, 19 grams of sugar, and 5 grams of protein. Dont forget this Silk Giveaway here! Oh yea, here’s something BRANDDD NEWWW! 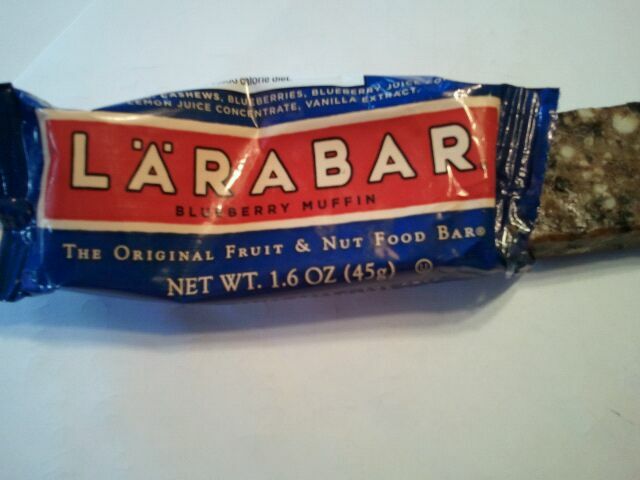 Yesterday I got a lovely package from LARABAR with some new Blueberry Muffin Larabars inside. YES! I love new products! I thought when I opened the box. 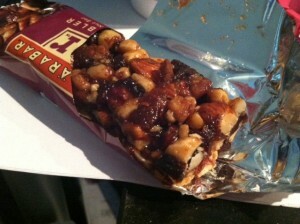 The bar was brown in color, with little pieces of nuts and blue spots for the blueberries. Strong cashew flavor, that really reminded me of a sweet cashew butter. It had a slightly tart and yet still sweet blueberry flavor as well. It was chewy, dense, and very moist. It’s pretty good, actually! Overall, 4 stars. While I liked the carrot cake or chocolate chip cookie dough Larabars better, this one was still quite tasty, and a great snack between meals! 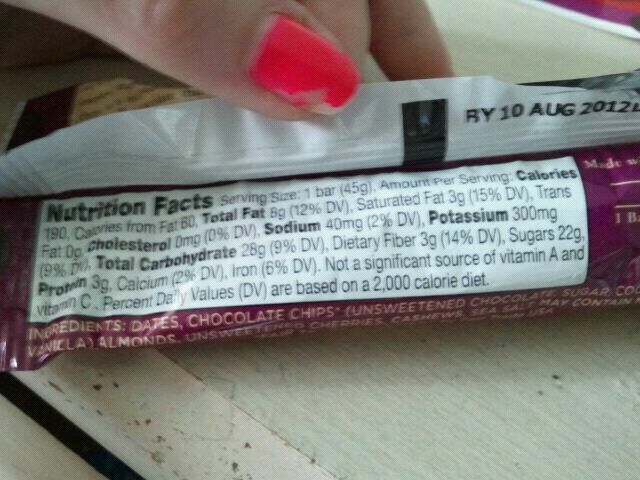 1 bar is 190 calories, 8 grams of fat, 26 grams of carbohydrates, 3 grams of fiber, 17 grams of sugar and 4 grams of protein. Dates, Cashews, Blueberries, Blueberry Juice Concentrate, Lemon Juice Concentrate, Vanilla Extract. 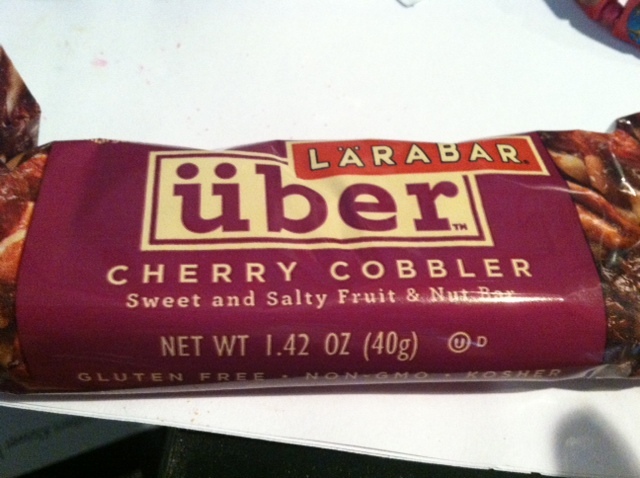 I was provided this bar to try for free from LaraBar. I was sent a few bars to try from LaraBar, including the new Chocolate Chip Cookie Dough flavor, and the not-so-new, Tropical Fruit Tart. I was excited- cookie dough anything has thumbs up in my book, and I do love fruity flavors as well. 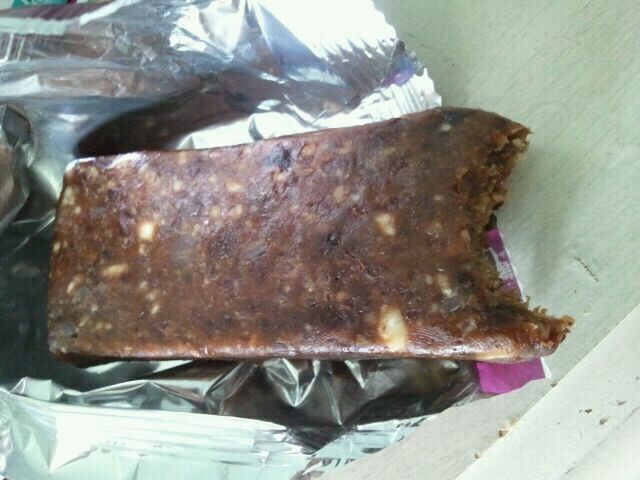 These bars are a bit on the small side than what I’m used to for the calories they provide. They are about the size of your 2 fingers for width, and your pointer finger for length, at 45 grams each. Overall, I really enjoyed these. I think it’s great that they provide healthy fats, some fiber and help towards your daily fruit servings, as well as having minimal ingredients and being all natural. Although small and calorie dense, I think they are a good snack or good before a workout. The back of the wrapper says they “will lift your vitality and provide energy with every bite”, and I agree. These rock! Tropical Fruit Tart- 1 bar is 210 calories, 12 grams of fat, 25 carbohydrates, 5 grams of fiber, 19 grams of sugar and 3 grams of protein. Dates, Pineapple, Unsweetened Coconut, Almonds, Extra Virgin Olive Oil, Coconut oil, Cashews, Orange Juice Concentrate, Orange Peel. Chocolate Chip Cookie Dough- 1 bar is 220 calories, 11 grams of fat, 28 carbohydrates, 3 grams of fiber, 19 grams of sugar, and 4 grams of protein. Dates, Chocolate Chips (unsweetened chocolate, sugar, cocoa butter, vanilla), Salt.